After Ben Hilmer and his wife, Sarah, had a baby, he began taking daily walks with his daughter around his Belmont Hills neighborhood. He called this trek "dad loop." And on "dad loop," a fire hydrant caught his eye. It's painted as a patriotic character, sporting a fading blue hat, and red-and-white striped pants. Before long, Ben was noticing more and more of these decorated hydrants around town. "Belmont doesn't have an established downtown," he says. "So the hydrants made it feel like a community. It made me proud to be from Belmont." Now he wants to know more about the hydrants. He asked Bay Curious: "Who painted the fire hydrants? And when were they painted?" We took Ben to visit his friendly local historian: Denny Lawhern. Denny has lived in Belmont more than 50 years, and he says the story of the hydrants goes back to the early 1970s. The United States was preparing to celebrate its 200th birthday — the Bicentennial — in 1976. Communities around the country hosted parades, fireworks displays and concerts — and a few towns gave their fire hydrants patriotic makeovers. Belmont was among them. The idea was inspired by a program called "Paint a Plug For America," which originated in Indiana. Denny says Belmont was also marking 50 years of cityhood when residents came together to decorate more than 300 of the city's hydrants. 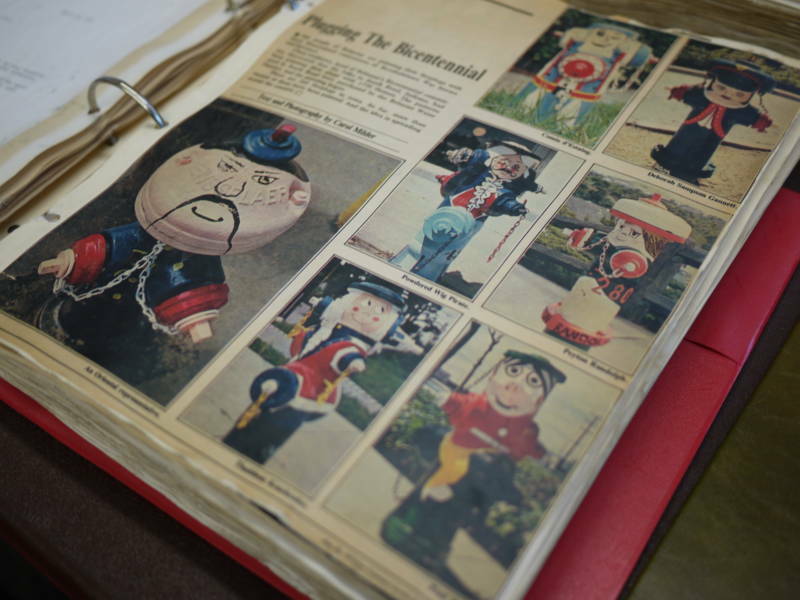 "When you decided what colors you needed, you came to my house and I gave you little baby-food jars of three colors, or 20 colors, or whatever you needed," says Judy King, a longtime volunteer with the Belmont Historical Society. At Belmont's History Room in Twin Pines Park, Denny shows us three big photo albums documenting the hydrant project. "I did a Betsy Ross," Denny says. "And there are probably four to five Betsy Rosses around town, but all of them are different." 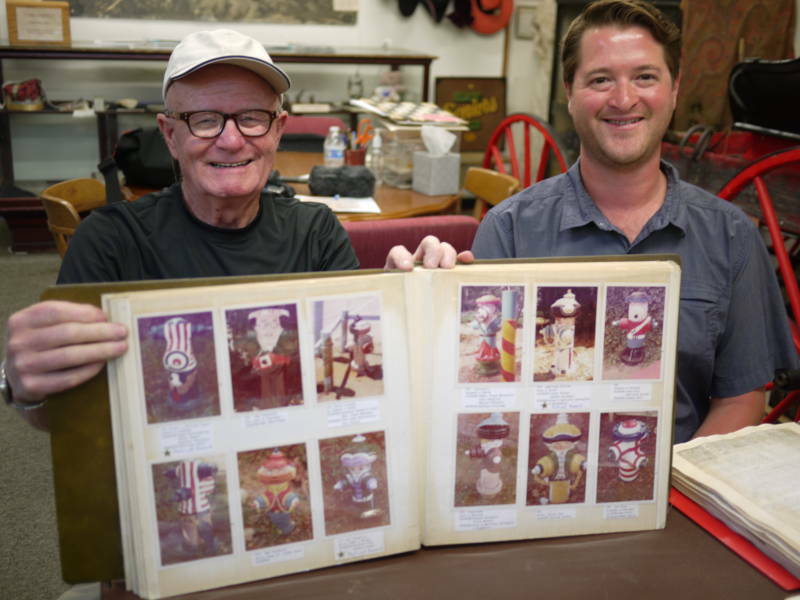 In the albums are a few designs that definitely wouldn’t get the OK today, including a Chinese man in a coolie hat with a Fu Manchu mustache, and a Native American character called “Chief Running Water.” But Denny says, for the most part, the designs focused on the patriotic. 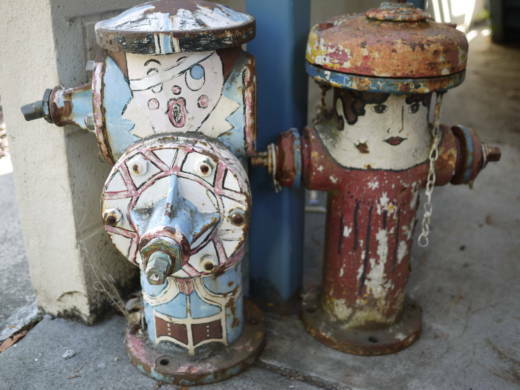 Over the years, due to age or damage, the army of painted hydrants has shrunk. They were almost wiped out completely in the '90s, when the 1991 East Bay Hills Fire changed state law. All fire hydrants had to be painted in uniform colors to identify water capacity. But Belmont’s “Happy Hydrants” were saved thanks to SB 1437, a bill signed in 1998. It allowed Belmont to use color-coded reflector buttons and curb markings near the decorated hydrants, instead of covering over their dapper duds. 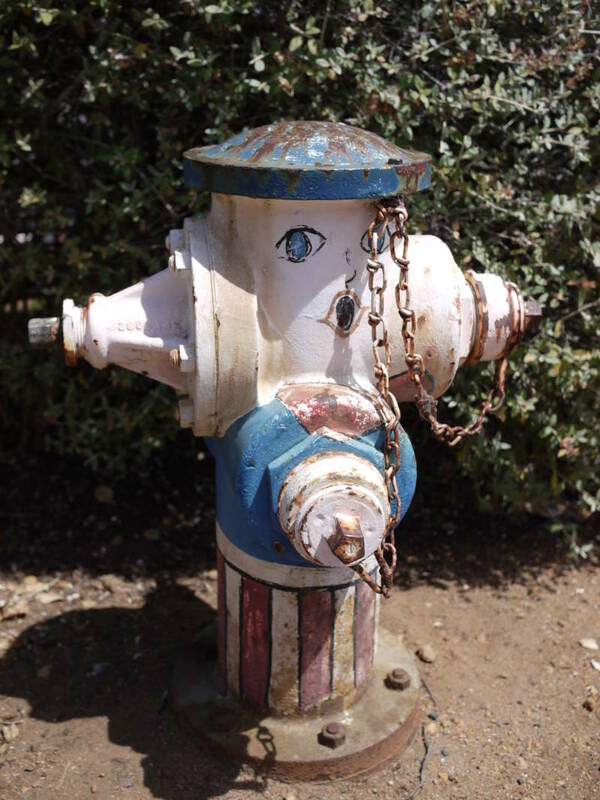 Today, Denny thinks there are only about 50 to 60 of the more than 300 original painted hydrants left. And most are in rough shape. 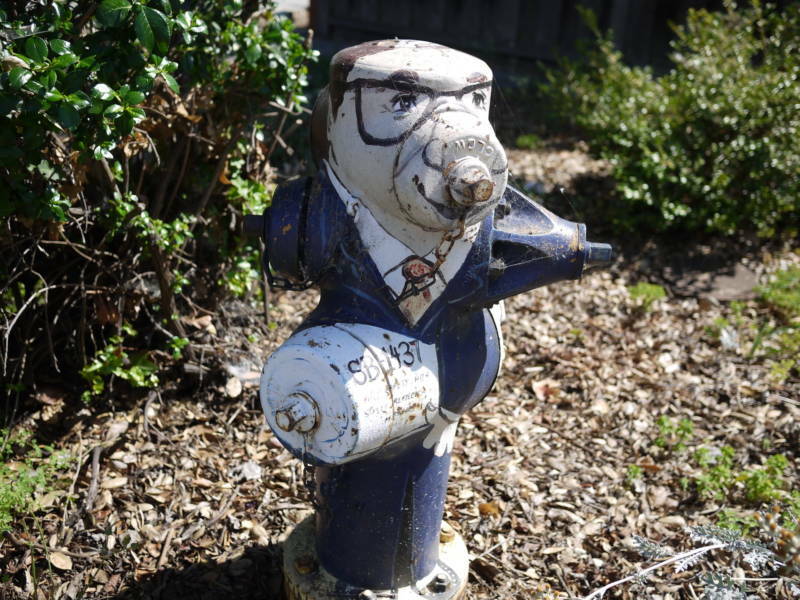 He says that a lot of the painted hydrants were in front of people's houses, and that upkeep dried up as families moved away. There have been a few Independence Day paintings after the Bicentennial, but nothing official. Denny hopes they can get enough interest to repaint them for Belmont’s 100th anniversary in 2026.